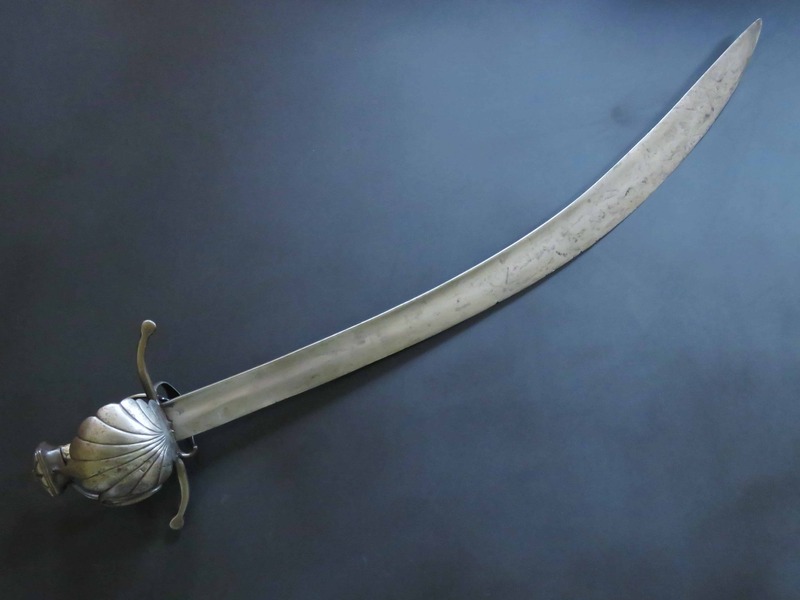 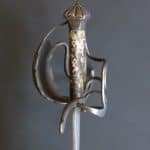 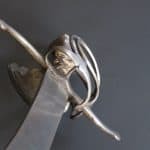 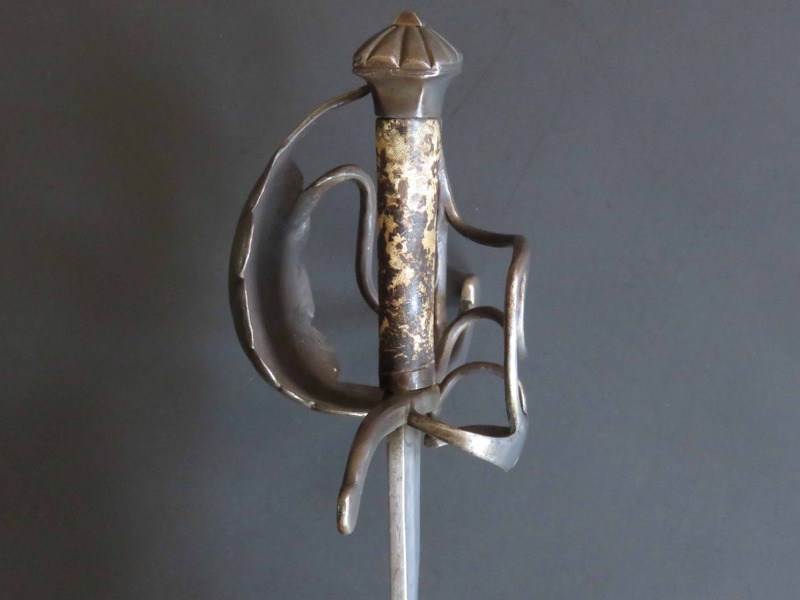 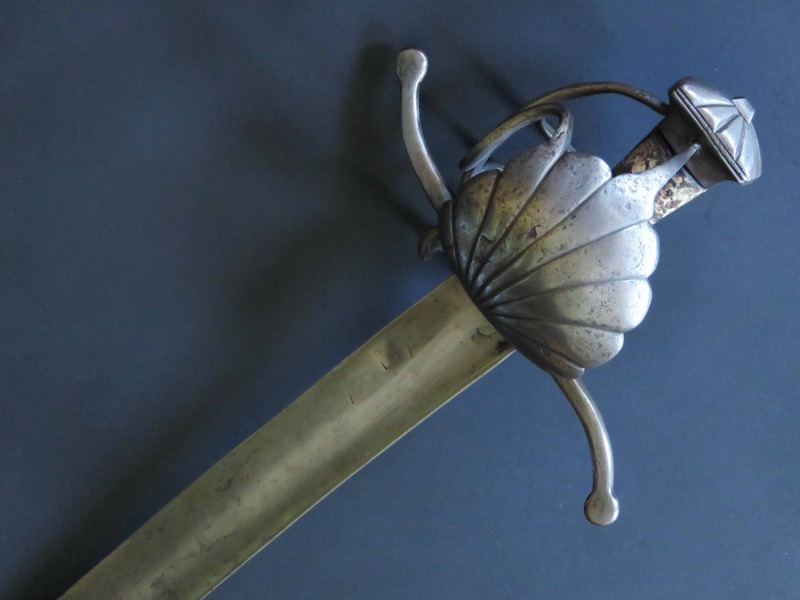 An imposing and robust North European sabre dating to circa 1600. 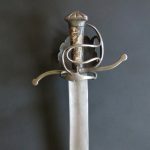 The hilt type conforms to the general group known as “Sinclair Sables”, with which the ill-fated Scottish mercenary expedition to Norway was equipped in 1612. 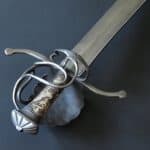 This is a well balanced and practical example. 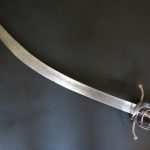 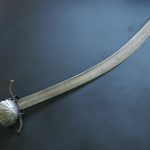 The imposing, heavy, stiff, curved blade is single edged, becoming double edged for the last quarter of its length, with a broad shallow fuller running underneath the spine from hilt to tip. 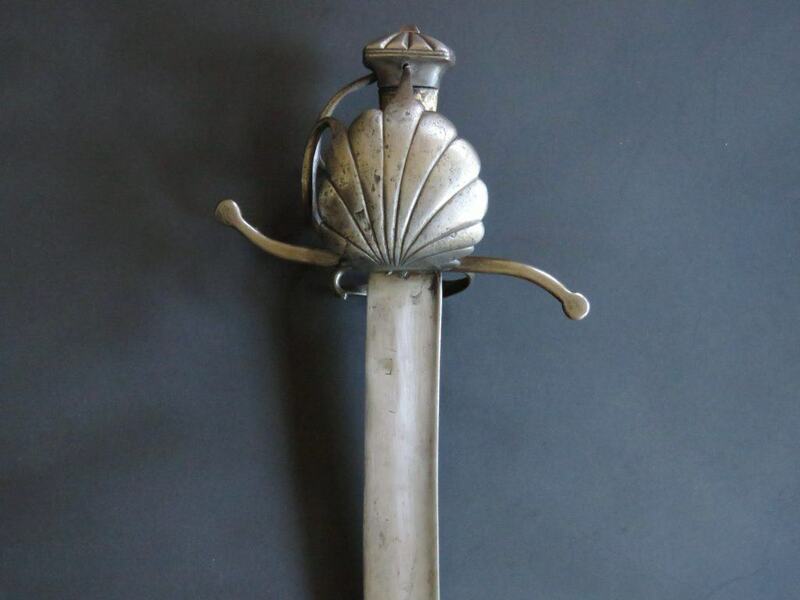 Near the hilt on one side a rubbed armourers mark is present inside an oblong panel, now indistinct. 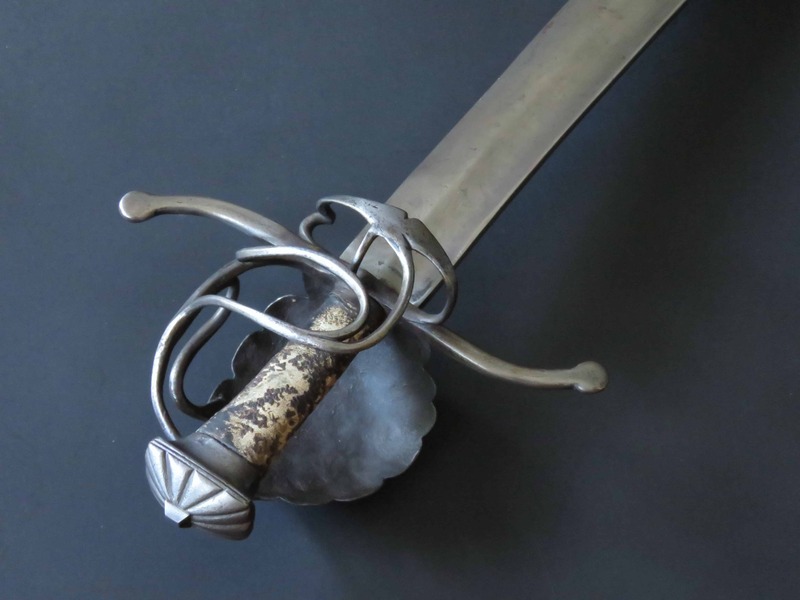 The hilt is constructed from a solid block from which two vertically counter curved quillons of rounded oval section extend to terminate in swollen spoon shaped terminals. 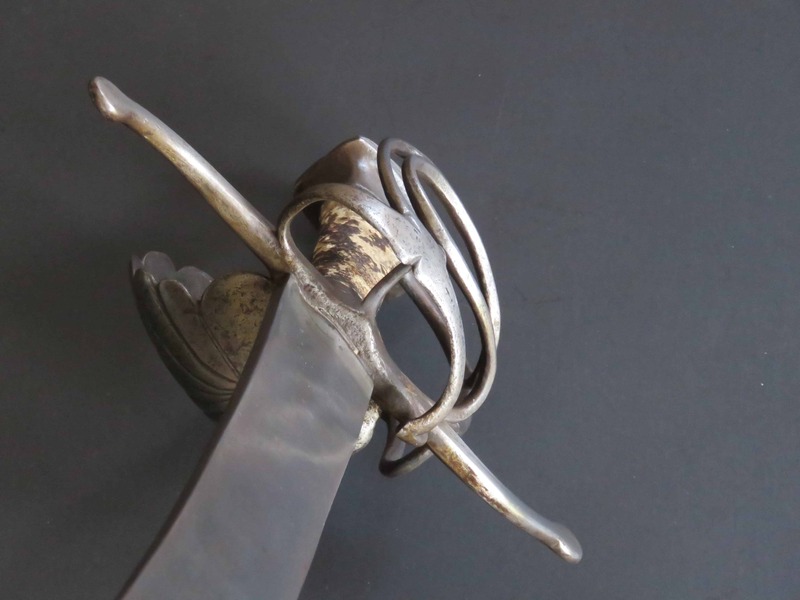 A knuckle bow extends from the front quillon upper surface, the terminal of which is secured in an aperture in the lower part of the pommel front. 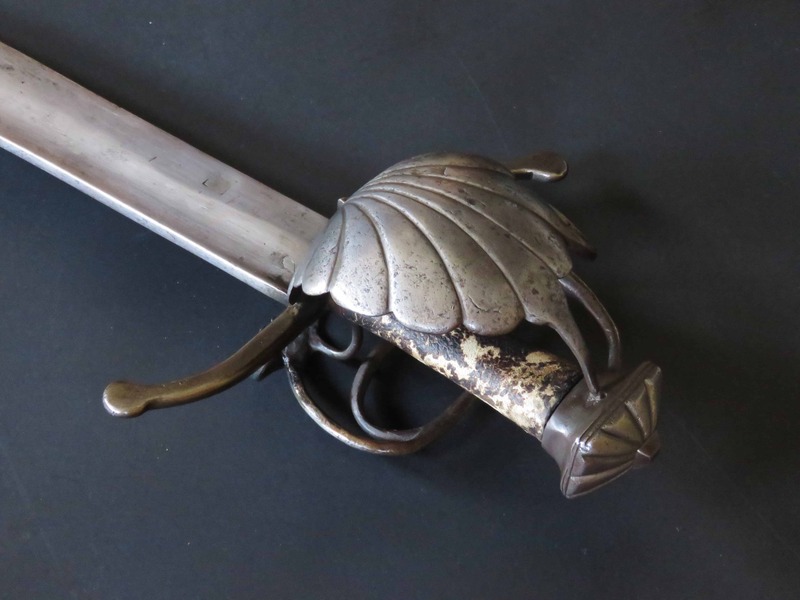 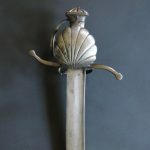 The outside of the hilt is formed with a strong scallop shell shaped guard joined to the pommel in a similar manner to the knuckle bow, by a single bar emerging from its top. 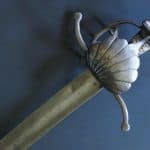 Cut ridges radiate from the base of the shell guard where it joins the quillon block to accentuate the scallop appearance. 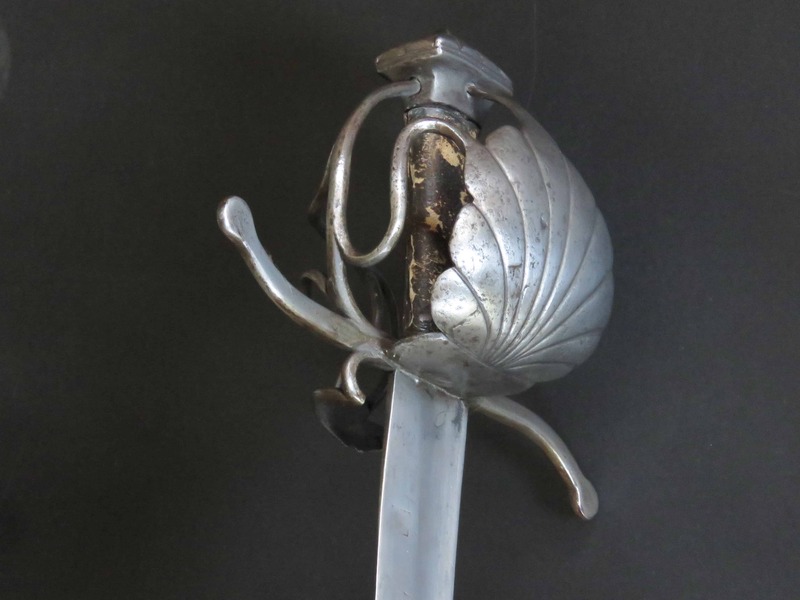 An “S” shape bar of rounded section strengthens the structure by joining the shell with the knuckle bow. 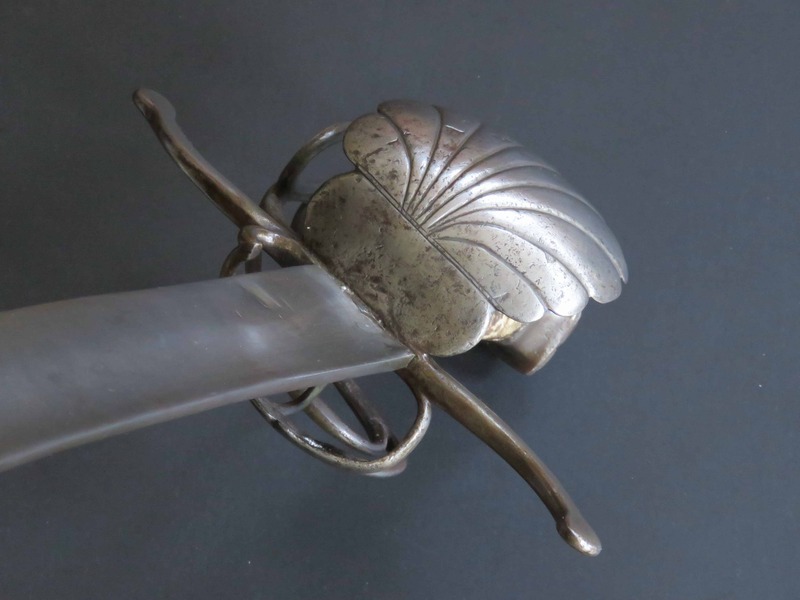 The inside of the guard is formed with an inner ring guard and thumb loop joined with the knuckle bow by two further scrolling round section bars above. 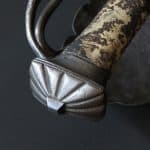 The original leather covered grip swells to its top where it meets with the underside of the pommel and is mounted with a copper ferrule at its base. 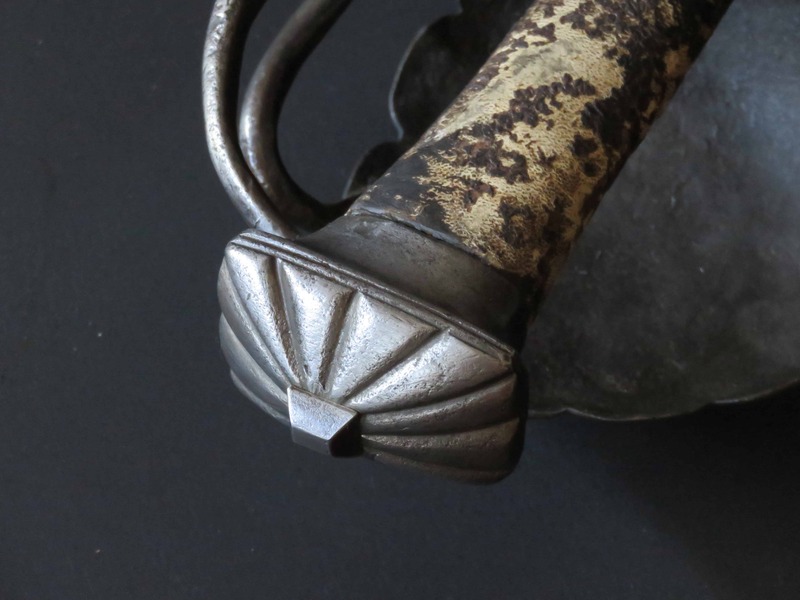 The oblong shaped pommel radiates filed lines of “scallop” form similar to the clam guard from its truncated pyramid shaped pommel button. 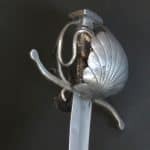 The pommel is cut with double decorative lines around its edge. 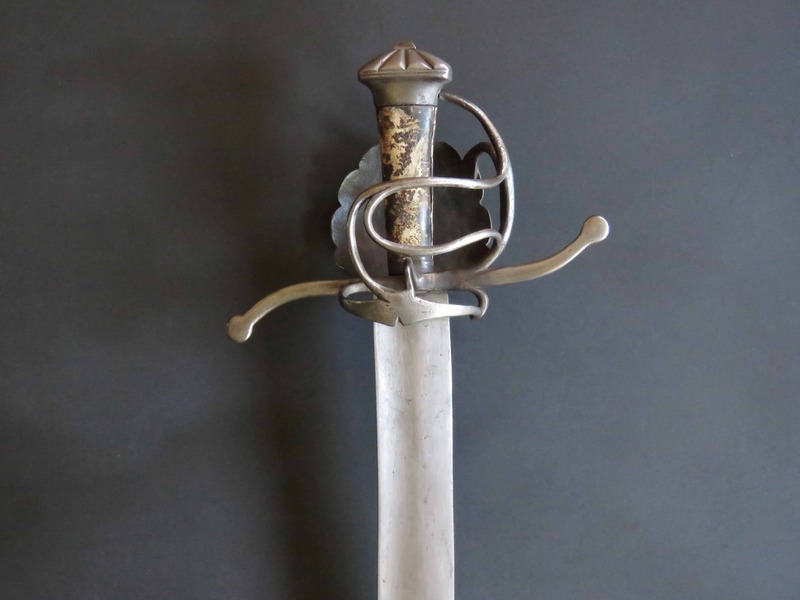 Beneath, the pommel base narrows to accommodate the oval shaped grip top. 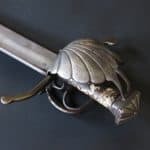 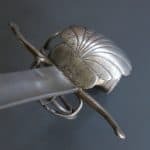 This is an interesting and rare sword which holds a place in the evolution of complex hilt design in the late 16th century. 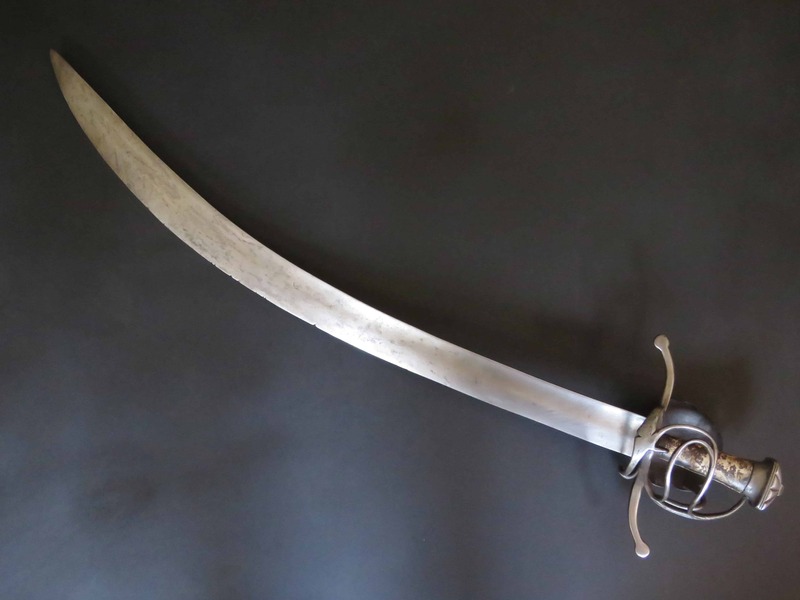 Blade 30.5 inches (80 cm) long and overall 37 inches (94 cm).